Despite my close proximity to the North Road area of Burquitlam, I have yet to fully explore all the restaurants that line the street. Tonight, we were racking our brains trying to figure out what to eat. Since we were going out as a family, the food needed to appeal to the kids. Wait, I mean my son. So that eliminates 75% of the food out there. Thus, we went for the ever so prevalent Chinese food. Hey, there is a Chinese restaurant of some sort every couple of blocks. It's almost like a rule of something here in the GVRD. 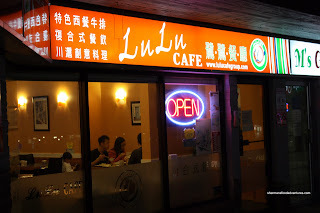 So, we decided to try out Lu Lu Cafe, which happens to be on North Road. I vaguely remember eating here before; but it wa s a different restaurant. If I don't recall, then I guess it wasn't worth remembering then! As we arrived, I noticed that Sushi California was going through a major renovation. Maybe they'll renovate their service too. Yah I know, that was cheap. One thing that struck me about the menu was the prices. Most items are roughly $10.00, which is quite reasonable in my opinion. 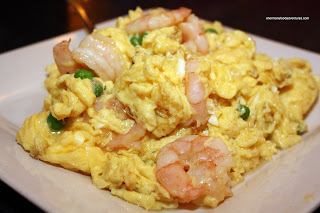 To satisfy the kiddies, we got the Stir-Fried Shrimp and Eggs. As you can see in the picture, the portion size is pretty large with lots of egg and big juicy shrimp. The s hrimp were cooked perfectly with a good crunch. It's too bad that the egg was slightly overdone and not really all that smooth. It was also a tad on the salty side too. 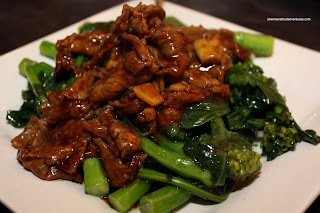 To add some veggies into our diet, we went for an ol' standby in the Gai Lan with Beef. This dish was pretty solid with crunchy stalks and tender beef. I particularly liked how the beef was seasoned with just enough oyster and soy sauce to give good colour and flavour. Next up was a dish that I normally do not order; but for some reason or another it caught me eye. Now for some people, they would rather avoid it. 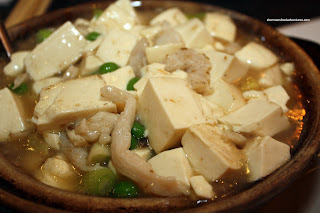 The Tofu, Chicken and Salted Fish Hot Pot is not for everyone because the salted fish is quite pungent. For me, it's delicious and provides a distinct flavour, especially in a dish that is predominantly consisting of tofu. This particular version was decent with large pieces of soft tofu. I would have preferred it to be a bit more salty. The Xiao Long Bao was something that I wasn't intending on ordering; but Viv wanted to try it. I normally stay away from it unless it's at an actual Shanghainese restaurant because it's never done right otherwise. Predictably, these were just okay. 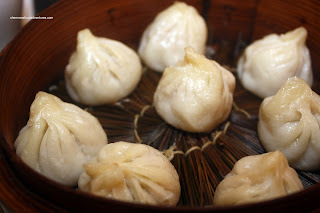 Surprisingly, there was a decent amount of juice inside each bun; but the dumpling skin was far too thick. Texturally, it was not a pleasant chew. Despite the average XLB, the rest of the meal was quite decent with good portions. I thought the prices were extremely reasonable considering the quality and overall execution of the food. Moreover, the service was actually quite attentive and friendly. Our server was actually a Mandarin speaker; but managed to understand my Cantonese when we ordered. The fact that she got the "no onions" part was extra impressive. 20 or less parking lots with Sushi California, Gogo Pizza, Cyber Internet Cafe & a hair salon all in the same tiny strip mall. You said it right EnbM! 20 or less parking spots for so many businesses... stupid... and no street parking around!!! it's amazing how anyone manages to go to these restaurants with crappy parking like enbm and you have mentioned. Tia, once again, I'm with you!